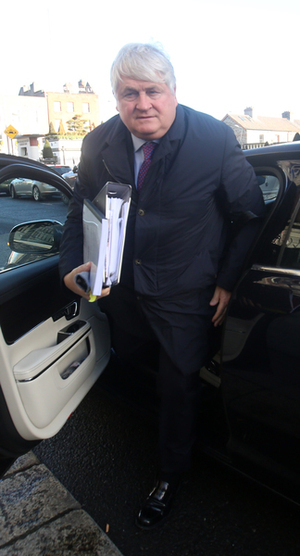 This morning Paul O’Higgins SC, for businessman Denis O’Brien, continues his cross examination of former editor of the Sunday Business Post about his articles on March 15, 2015, pertaining to a 2008 PricewaterhouseCoopers report. Mr O’Brien claims the articles were defamatory of him. The Sunday Business Post denies this. The confidential PwC report was a Government-commissioned report in which PwC listed the top 22 borrowers of Ireland’s six banks in 2008. The Sunday Business Post reported that PwC recorded Mr O’Brien as No.10 on the list. In November 2008, after getting the PwC report, the then Taoiseach Brian Cowen told the Dail that Ireland was right to guarantee the banks in September 2008. He also told the Dáil that there was enough money in Ireland’s banks for the next three years. The Sunday Business Post reported that the PwC report showed it believed – in its worst case scenario – Ireland’s banks would lose €10.6billion. Ireland would eventually go on to get a EU/IMF bailout for €64billion in 2010. It’s also heard, on a number of occasions this week, how Mr Lyons destroyed his copy of the PwC report on St Patrick’s Day 2015 by putting it through a shredder in the offices of the Sunday Business Post. He said he did this to protect his source as he believed the document was traceable. Mr O’Higgins SC, for Mr O’Brien, quipped yesterday that this was like the “St Patrick’s Day massacre” – a reference to St Patrick’s Day in 2008 when €3.5 billion was wiped off the value of stocks on the Irish Stock Exchange. A common refrain from Mr O’Brien’s legal team is that they have not seen the PwC report. Mr Lyons also said he found it “shocking” that Mr O’Brien said he wouldn’t put it past Mr Lyons to just stick Mr O’Brien into the articles. Mr Lyons rubbished the suggestion that Mr O’Brien was the victim of some kind of “crazy conspiracy” cooked up by him and the former editor of the Sunday Business Post Ian Kehoe. The jury has also heard that at the time that the articles were published – in March 2015 – the Banking Inquiry was under way. It heard that the inquiry contacted Mr Lyons for a copy of the PwC report. But, at this point, Mr Lyons said he had already destroyed it. 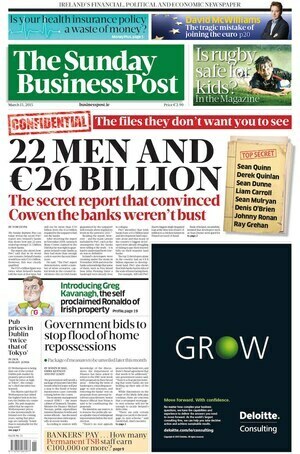 In PwC’s core book of evidence for the Banking Inquiry – which is publicly available online – one section of it’s evidence appears to match the headline figures reported by the Sunday Business Post on March 15, 2015. 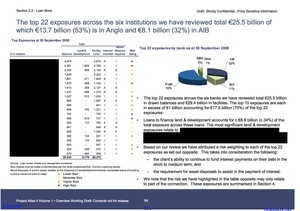 The top 22 exposures across the six institutions we have reviewed total 25.5 billion of which 13.7 billion (53%) is in Anglo and 8.1 billion (32%) in AIB. 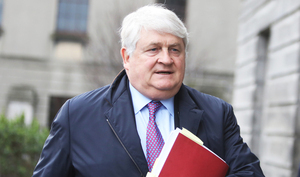 Posted in Misc and tagged Banking Inquiry, Denis O'Brien, PwC report, Sunday Business Post at 11:00 am on February 14, 2019 by Bodger. Fantastic reporting Bodger and Broadsheet,well done.The rating agencies must be nervous huh ! They described the bond extensions as defaults,are they next ? We need more journalists like Tom Lyons. Him & Kehoe leaving the Post is a big blow. On the one hand, yes but on the other hand….do up your tie and sort out your top button boy! So, the totals in the PwC report that HAS been published equal the totals in the SBP report which included Denis O’Brien’s borrowings? Doesn’t that prove that Tom Lyons wasn’t “maliciously” or “gratuitously” including Denis O’Brien on the list? Jebus, the idea that Ian Kehoe, Gavin Sheridan and Tom Lyons, three of the most respected journalists in the country would concoct an article and falsely insert Denis O’Brien into it, knowing his reputation for suing all and sundry is ridiculous. I have been asked to clarify that “Kool and the Gang” is not a criminal enterprise. The “gang” is in fact a group of musicians, dancers and backing vocalists and their front man, Mr Kool is not, nor has ever been, involved in organised crime. I am sorry for any unintended implication to the contrary. Did they “leave” the SBP, or were they pushed ? As in, if they’re not in the employ of the SBP anymore, then if they lose the case, the SBP won’t be sued to high heaven ?? 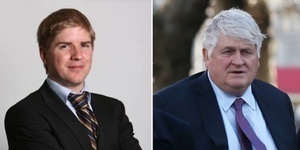 One of the bizarre aspects of this case is, Denis O’Brien is suing the publisher of the Sunday Business Post and NOT the individual journalists. In the past, as far as I can see, Denis has always sued the journalist as well as the publication. Also, the SBP is living hand-to-mouth, it’s probably loss-making despite the management claiming it’s not. The circulation figs for the second half of 2018 will be out next Thursday but I’d be surprised if it was selling more than 25,000 in the latter part of 2018 and now that Tom and Jack have gone, it’ll probably struggle to sell 20,000. Therefore, who’ll pay the legal costs and damages in this case? Does the SBP have the funds (if it loses)? What’s the libel insurance situation? Why is the SBP severely restricting its defences? 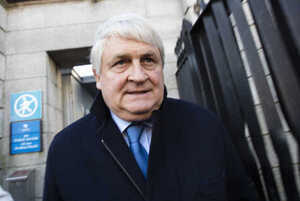 They could have a field day on Denis O’Brien’s reputation which he’s suing to protect. Bizarre.